This horse is very sweet and experienced, the ideal training horse. Hardy is a calm source of strength. His good-natured demeanor conceals excellent jumping skills; the rider just has to know how to get him started. Hardy, whose nickname is Dydys, is my leading horse. After a wonderful season in 120 and 125 class, we entered 130 and 135 class in 2015. However, I still have a lot to learn, since it is not at all easy for me. Jiva has placed in the 125 class and completed a 130 class in Marsens at the age of six. Jiva is a young mare with a great deal of potential. She is charming at the stable, and she learns very quickly in preparation for competitions. She possesses an excellent combination of strength and speed. This lively horse is a force to be reckoned with on a circuit and a great delight to ride. I love her warrior side, although I do not always have total control over her actions. Nicolas Luu Duc entrusted the young, very sweet Avoriaz to me for a year of training. With an easy, tranquil character and a good jumping technique, “Vovo” wins hearts over, especially mine 😉. He placed in R105 in 2015 and in 110 this year at the CSI* of San Giovanni in Italy and, notably in the 115 class, at the CSI of Barbizon in France. He began participating in the 120 and 125 classes in May at Saignelégier. In July, Avoriaz returned to the stable run by Julien Gonin, my French trainer. I will miss him a lot, since I have become very attached to him. This very sweet horse is very easy to care for and transport. Bandit is easily distracted during training, but shows determination in obstacle courses and is very respectful. He shows a lot of heart and grit. Bandit finishes the great majority of his courses without error and has placed in almost all the competitions in which he has participated (he placed 12 times in four months and won 6th place at the Coupe Neuchâteloise). Among my horses, this is the mount who has shown the most spectacular progress. I thank his owner, Mr. Didier Kreis, for placing his trust in me. Bandit will be continuing his career with the rider Christel Aguirre, who formerly kept my pony Orlando in half-board. I wish them a great deal of success. A very respectful, generous pony who loves to eat way too much! Orlando now belongs to my nine-year-old brother. He is also my mom’s favorite. She loves to ride Orlando, and I sometimes enter R105 events with him since he is such a pleasure to ride. Little Orlando has a relatively tranquil disposition. He is not edgy by nature, and if he had his way, he would graze all day in the pasture, since that is his favorite activity. He is very generous on the track, and he eagerly makes an effort for his rider, overlooking human errors. He can jump 1m10 from a standing position if he needs to; or he will work hard to cover an oxer after a double combination. During the 2015 season, Orlando was in half-board and he competed in pony events with flying colors (he only got one four-points penalty throughout the whole season!). This is the mount that has placed the most with me, and with whom I shared a stellar start in my competition experience! View the video of Orlando P120. daughter of Machno Carwyn (the biggest international award-winner in Europe with more than 200 placings in CSO). Salsa is a pleasure to ride at walk in surrounding forests. On track she is very competitive and fast. She is a good jumper because she is very smart. She has an incredible mind. She is brave and quick learner. 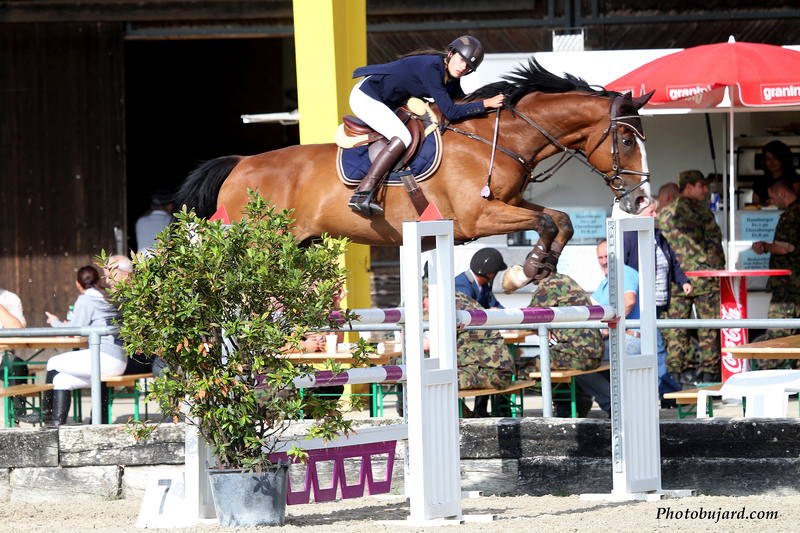 See the video here video of CSIOP in Chevenez. She is very successful the last weekends (first and 4th in the 120 pony class, 2 times 5th in the 120 junior class, 7th in the 125 junior class in Elgg). Video of the victory in the P120 class. Salsa was sold in the month of May 2015 and I was very sad to see her go. I wish her all the best, since she is a very sweet little pony and she deserves to have a kind rider. My ponies were sold by Pierre Brahier at the Corminboeuf equestrian center. I still have my first mare, Kelly de Villars, who is enjoying her retirement in the area near Estavayer.